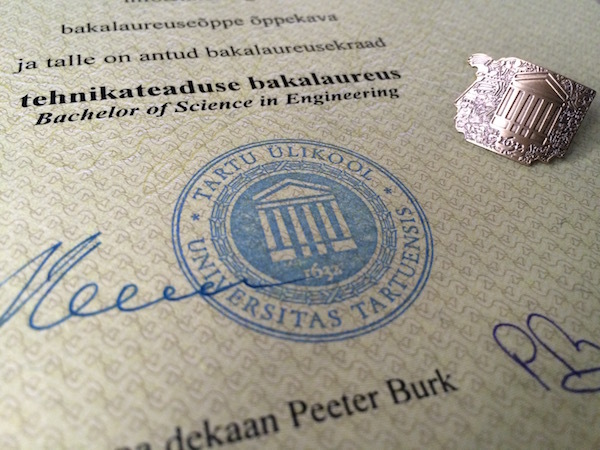 Irina Ivanova About Software Testing: Bachelor Thesis "Version Update Automation Using Scripting Language Bash"
Bachelor Thesis "Version Update Automation Using Scripting Language Bash"
I've finally finished University of Tartu, so I am a Bachelor of Science in Engineering now! My work was about version updater bash script, that I made on my work for updating Java applications on different web servers. I once wrote a post about first version of this script – Scripting For Automated Update (Tomcat 6) [DEPRECATED], – the final version has more features and much more code. The thesis is written in Estonian and can be found in GitHub – Version Update Automation Using Scripting Language Bash.pdf (or in UT registry). The script itself is open-source (currently only Tomcat 8 part) and can be used in other projects. It's located in GitHub repo – github.com/iriiiina/version-updater, the manual about install, configuration and usage is in GitBook – iriiiina.gitbooks.io/version-updater-manual. I feel proud that I got A for the thesis, but I don't have any good feeleings about finishing the university itself. Two years ago I wrote a post Secrets of a Buccaneer-Schoolar by James Marcus Bach where I explained my opinion about the university and hight schools, so it wasn't the priority for me. I decided to finish just to not loose already gotten points for finished courses – I've already passed 99% of the programm, so it would be a shame to spend that time for nothing.